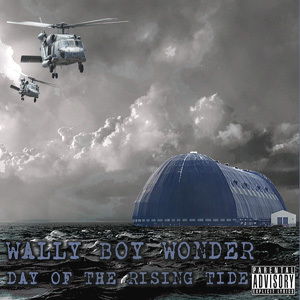 "Day Of The Rising Tide", Wally Boy Wonder's second LP on Intolerance Records exceeds all expectations of an artist undergoing evolutionary growth, revolutionizing the Midwest Hip Hop scene. His last Album, “Where's Wally?”, featured members from the well known groups, “Filter”, “Warrant” and more. We raised the bar on “Day Of The Rising Tide” with a guest appearance by former Warner Brothers Artist Duma Love on Wobble Bobble! A street poet at heart, Wally's dedication to lyrical mastery has reached maturity on this release. Produced by J. Shepherd, a veteran with dozens of albums to his credit, Wally's talent is exploited with addictive hooks, head bobbing beats and thundering basslines. To ensure the success of this sophomore release, Intolerance Records has implemented a full scale campaign including television and radio spots, major and college radio play, regional tour, an elite Internet marketing strategy and a well established grass roots street team. In addition to electronic downloads at all major online retailers, “Day Of The Rising Tide” is also available in physical CD format and distributed at brick and mortar retail outlets.